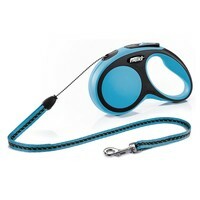 Flexi Comfort Retractable 5m Cord Lead (Medium). The handle of the Comfort Medium Lead can also be adjusted using a simple turn screw to ensure it fits comfortably into any size hand. The lead has been designed to extend up to a distance of 5m (16ft), allowing your dog more freedom, whilst allowing you full control and the ability to retract your pet as needed.